Do you already have a special Halloween hearse to drive around in GTA Online? No? You need a special Halloween hearse. From now through November 15, you can become one of those cool customers you sometimes see leading a single-car funeral procession through downtown Los Santos just by hitting up Southern San Andreas Super Autos and dropping $650,000 for a Lurcher. Sure, with only two seats and awful handling, the Lurcher Hearse may not be as practical of a choice as that Halloween motorcycle with the giant skull on the handlebars. But c'mon - it has a zombie mannequin clawing at the back window! The vintage Franken Stange hot rod is also back in stores until November 15 for $550,000, as are a bunch of horror-riffic masks. 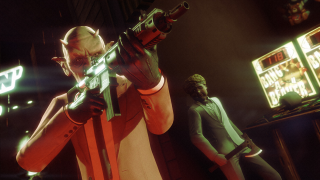 If you need to build up some cash to start investing in your work-from-home mortuary business, make sure you log in on Halloween (October 31) to benefit from the one-day horror playlist: the Slasher, Beast vs. Slasher, and Come Out to Play Adversary Modes are all featured with double GTA$ and Reputation Point rewards. You'll even get two horror-movie themed T-shirts just for logging in. And be sure to check out the rest of the big Halloween game events going on this year.